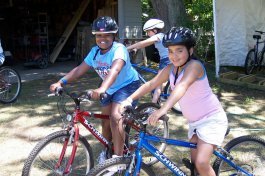 "Camp Blodgett has been helping kids enjoy their summer on the shores of Lake Michigan for more than 95 years! Camp Blodgett serves children in Kent and Ottawa Counties in West Michigan. Camp Blodgett is located 45 minutes west of Grand Rapids at 10451 Lakeshore Drive in West Olive. Financial Assistance: To ensure that all children have the opportunity to attend summer camp, fees for summer camp at Camp Blodgett are determined using a sliding fee scale based on family income and household size. Transportation is also provided to and from the camp from Grand Rapids for all campers. Camp Blodgett also offers a 4-week academic camp, the Camp Blodgett STEM Academy, designed to enhance academic growth in STEM subjects for youth who will be entering grades 6-8 in the school year following their camp experience. This program runs during the regular camp program and is for children who are looking for academic assistance in STEM subjects during the summer months. The Camp Blodgett STEM Academy accepts youth who are below or approaching grade level in math and/ or science. To participate, youth must live in Kent County, apply and be accepted into the program during the winter months, commit to attending all 4 weeks of the program, agree to participate fully and cooperatively, and demonstrate economic need. Those interested are encouraged to apply by calling the camp office or emailing the STEM Coordinator at the address below. Acceptance into the program is limited to 40 youth.